Actually there is no official way to convert to Buddhism. If you feel drawn to Buddhist principles and state that you are a Buddhist, you will be accepted as such without having to document or formalize anything. 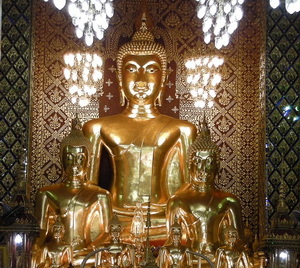 Buddhism in Thailand has a remarkable tolerance and acceptance of other religions and faiths. Foreigners are always welcome in all temples. They are free to attend any ceremonies or festivities. There is a total absence of competition between religions, and no attempt is ever made to convert anyone to Buddhism, even if westerners spend extended periods of time in meditation temples. 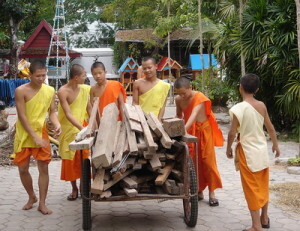 The Thais have the attitude that true spiritual concepts do not belong to any one culture or religion. They surface in different shapes and stories and legends and show us that below the surface there is much more similarity than difference in the world. I remember once I walked by a temple and noticed that there was some kind of festivity going on. I decided to go in and investigate. It turned out that this temple was creating a new Buddha statue. They had commissioned a group of artists who literally built a big Buddha statue right there while a crowd of people was watching. I was the only foreigner there, and the Thais were quite curious about me. Soon some of them who spoke English came up to me and offered to explain what was going on. They were all very friendly, helpful, and happy to tell me the story of this temple which was quite fascinating. When the Buddha statue was almost finished, I found out that a hollow space was left inside. Next tiny sheets of soft metal were passed around, and all the attendees engraved their name on them. I was given the opportunity to do the same. Finally all the hundreds of little sheets of metal with our names on them were placed inside of the Buddha statue for our spiritual benefit and the hole was closed permanently. All the while soft temple music was playing, food was offered freely, people chatted and smiled and socialized. There was no hushed, reverent atmosphere. It felt more like a party with spiritual overtones. Although I was a total stranger to these people, I was instantly treated like part of the family, and at the same time nobody tried to convince me of anything. They were perfectly okay with the fact that I was not a Buddhist, and they were just as happy seeing me there as I felt welcomed and included by all of them. 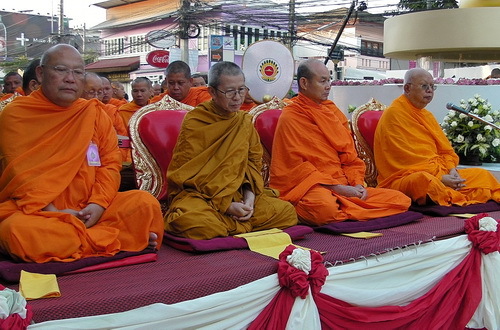 This was a wonderful opportunity for me to see the religious tolerance of the Thai Buddhists in action. 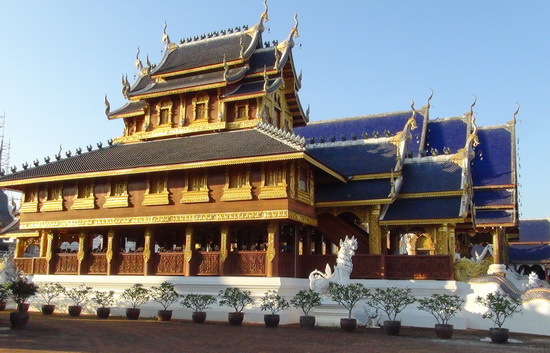 I have had several such experiences in Thailand, and every time I was impressed by the easy and natural way how I was included and accepted without prejudice. The author, Shama Kern, has been a resident of Thailand for over a decade. He lives with his Thai wife in Chiang Mai. what your opinion is by leaving a comment below.